Today, markets increasingly require more customized products, with shorter life cycles. In response, manufacturing systems have evolved from mass production techniques to the ?exible automation. This paper argues that manufacturing systems of the next generation will have to incorporate more ?exibility and intelligence, evolving towards recon?gurable manufacturing systems. In particular, the concept of intelligence becomes more relevant because of the need to maintain e?ective and e?cient manufacturing operations with minimum downtime under conditions of uncertainty. 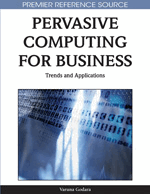 This chapter presents some research issues related to the development of reconfigurable manufacturing systems with pervasive computing.